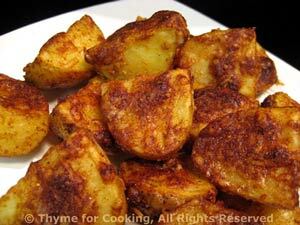 Parmesan Potatoes, Thyme for Cooking easy side dish. Simple, grilled or roasted potatoes are perfect with equally simple, grilled meats. These have a coating or crispy, golden Parmesan cheese when finished. Put them into a pan used for the barbecue grill and cook for 25 - 30 minutes or until done... and you will need to stir them with a long-handled wooden spoon occasionally as they tend to develop 'hot spots' and can get a little crispy.